Dear Science, Will Yeast Engineering Change the Way We Make Beer? Brewer's yeast has been modified to make both alcohol, and hop aromas by researchers at Berkeley and the US Department of Energy's Joint Bioenergy Lab. Charles Denby, Rachel Li, Jay Keasling and a number of collaborators recently published a paper in Nature Communications. They describe a technique to modify brewers yeast to express two molecules known to contribute hop flavor and aroma. The paper provides an analysis of the relative expression of these compounds, as well as the yeast's fermentation efficiency. Quite remarkably, the authors report the results of a tasting panel trained by Lagunitas Brewing Company to assess beer flavors in ~10 gallon batches of beer. Should we call it home brew? Lab brew? Sci-brew? If I had any idea that beer tasting notes could be publishable in a Nature journal, I would have considered more strongly a career in academia. As cool as all this is, what does it mean, and why is it important? There are two incredibly important steps forward in this study: modification of a cell factory to simultaneously produce more than one desired product, and formal approval of human taste trials with a modified brewer's yeast. To put it in context. Yeast is one of the most studied microorganisms on the planet, going back to Louis Pasteur's 1857 discovery that yeast was in fact a microbe, and that it was responsible for fermentation. Yeast genetics has been studied since the 1930s and 1940s. The yeast genetic sequence was first published in 1996[S. Engel, et al.]. In addition to making billions of barrels of delicious beer, yeasts have been work horses in pharmaceuticals and industrial biotech. In 2011, 20% of approved drugs manufactured using genetically modified cells used genetically modified beer yeast, Saccharomyces cerevisiae, as a cell factory. Hungry yeasts have been key to produce new biofuels. The trendy emerging gene editing toolkit, CRISPR-Cas is well documented in yeast. It has even been used to boost expression of typical yeast flavors - like banana puree. In short, there's nothing novel about GMO yeast. There's not even anything new or fancy about how this team made their yeast. The innovation is targeting production of not one, but two or really three products if we count the ethanol. The study's yeast strains were modified to produce two essential oils common to hops and other plants: the monoterpines linalool, and geraniol. The former has an aroma of lavender, and the latter smells of roses. The yeast also had to express these oils while maintaining the capability to efficiently ferment sugars to alcohol. You know, to do it's job and make beer. The modifications successfully maintained the viability of the yeasts, while programming them to produce new compounds associated with a noticeable dry hop aroma. Previous genetic engineering, whether industrial, pharmaceutical has focused on making one product: ethanol for biofuels, insulin, collagen or enzymes for pharma. In the beer applications, compounds associated with one particular aroma were emphasized. In all of these cases, the strains are optimized to crank out one target molecule. The others are minimized as impurities. This team offers a more holistic approach and envisions a more comprehensive application of genetic engineering. The cell factories of the future will be multi product, and will multi task. The sci-fi possibilities are very exciting. There is also some real world, tangible benefit for brewers. Hop crops, like wine grapes, and most other plants vary from field to field and year to year. Brewers and beer drinkers tend to value consistency of flavor over the quirks of terroir. Maybe it's not romantic to manage blends of ingredients to ensure that a batch brewed in October just after the harvest, tastes as good as one in June or even the next year. It is however necessary, in order to provide a consistent product. New yeasts could help to manage the more delicate parts of the flavor profile. There's also a potential cost improvement. Flavor and aroma hops are added at four or more times the rate, in net weight, as bittering hops. Any home brewer will confirm, that beers with strong fruity and floral aromas are not cheap to produce. Modified yeasts could cut the hop bill. 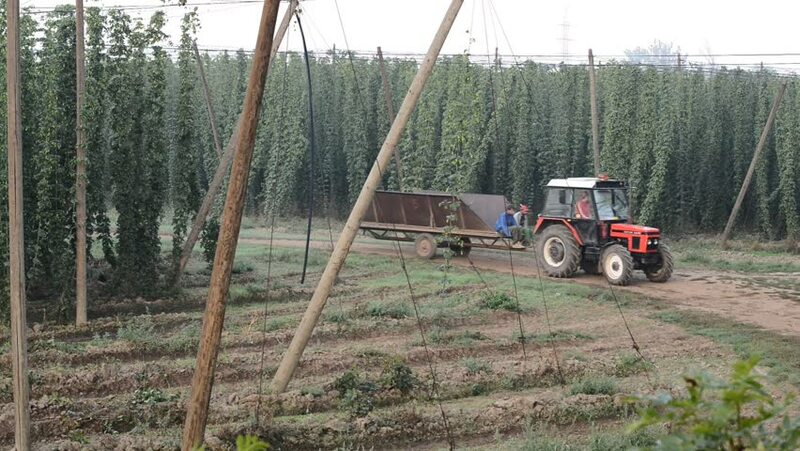 Farmers would respond by growing more high impact hops, or less resource intensive crops. This implication formally interests the US DOE. Although I imagine, it's still more fun to talk about the beer aspects after work. The other cool gift of this study, is that the authors pursued and received Institutional Review Board approval to conduct human tests of the beer made by their modified organisms. This is the first such trial in beer, and required a rigorous evaluation of public safety. The authors conducted two tastings with employees of Lagunitas Brewing Company, a venerable institution with a reputation for crafting hoppy beers. The tastings included 27 people, and 13 people respectively, to to compare the hop character of beers brewed with study yeasts to a control brewed with WLP001 California Ale Yeast. The human tasters confirmed the results obtained in the analytical chemistry labs. The experimental yeasts brewed beer with more hop character than the conventionally clean, and popular craft beer yeast control. It's a fun study that does inspire some thoughts about the future. Multi product cell factories will do a lot for us in the future. Beer brewing will just be one area impacted by emerging biotechnology. If we put on our futurist hat we may wonder will future space brewers skip hop additions entirely? The answer is a resounding yes. Life at the final frontier will be incredibly resource constrained. tall vines. These make for gorgeous fields in the Yakima Valley, Bavaria, and the Czech Republic. However they will look silly in a cramped space station. Unless the hop vines are shown, or engineered to be, remarkable air purifiers they will be considered a waste of space and resources. It's likely that unbalanced beer would be no more popular in space than it is on present day Earth. Modified yeasts offering the balanced flavor profile of real beer seem like the best way to make good beer in the belt. The bigger, deeper question, is will yeast do it all? Once hop flavors are mastered, will gene editors look to retool yeast to provide malt flavors? Perhaps space beer will be brewed from simple sugar water, and super sophisticated yeasts.